Each UK local authority has a dedicated page on MYB with contact information, a map location and full details for principal council officers and councillors – the council's key decision makers. Contacts can be saved to your address book for easy reference. Other key information is included on this page on the local health authority, police authority, parliamentary constituency and council structure. Headline council statistical data also features, with information on political composition, council spend, workforce composition of full and part-time staff and population demographics. 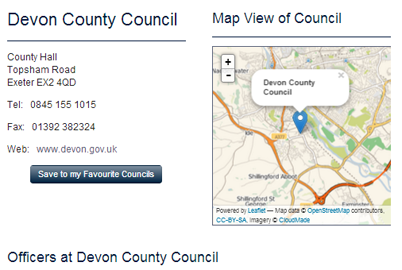 Once logged in, MYB provides you with quick navigation tools including a simple A-Z of councils across the top of the screen. Click on a letter and a drop down menu displays quick links to councils, a convenient feature if browsing a number of authorities across the UK. MYB holds and maintains a range of datasets on the UK local government sector. 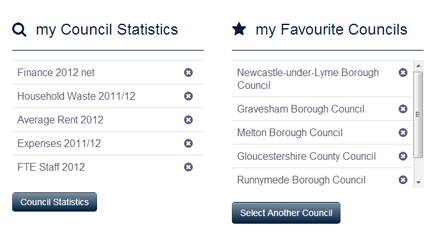 The council statistics feature allows you to dig into this data and download the results as a spreadsheet. Featuring data from key service areas including environment, finance, housing and corporate services, this feature allows you to identify councils by a number of different demographic criteria. And if you are looking for metrics not listed, ask about our bespoke research services. A key benefit of MYB is personalisation. As you navigate the site, a range of functions allow you to save information to 'my MYB' – effectively your personalised home page – for quick reference. The my MYB dashboard also contains information on your subscription, login details and any orders you have made through the system. In the dashboard, you can add notes next to each contact. As you navigate the MYB data online you can save searches so they appear on your dashboard for easy reference. Many MYB users regularly use contacts for the same group of authorities. 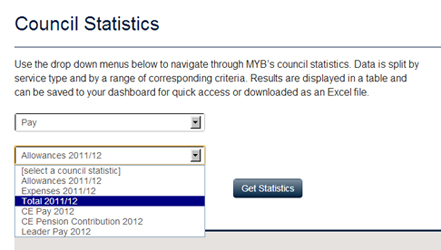 MYB allows you to save these councils to my MYB so they are always to hand. The MYB Address Book is your personal contacts book. As you navigate the principal officers and elected members online, you can save them to your address book for easy reference.